(APN) ATLANTA — The brand new Buckhead Atlanta mixed-use development is set to feature a substantial planting of new, mature trees. The swooping cranes that languished in states of non-productivity for years have come down; and the six-block assemblage of upscale boutiques, restaurants, and condominiums is poised to open in mid-September 2014. The project’s developers insist that a “green” initiative will help the high-end enclave blend seamlessly with existing sites on the upper-echelon of the intersection of Peachtree Road and Piedmont Drive. Toward that end, the Buckhead-based developer OliverMcMillan hired the Chicago landscape architect, Hoerr Schaudt, to install an array of plants intended to “connect the destination to the larger community and delight and excite visitors for decades to come”. 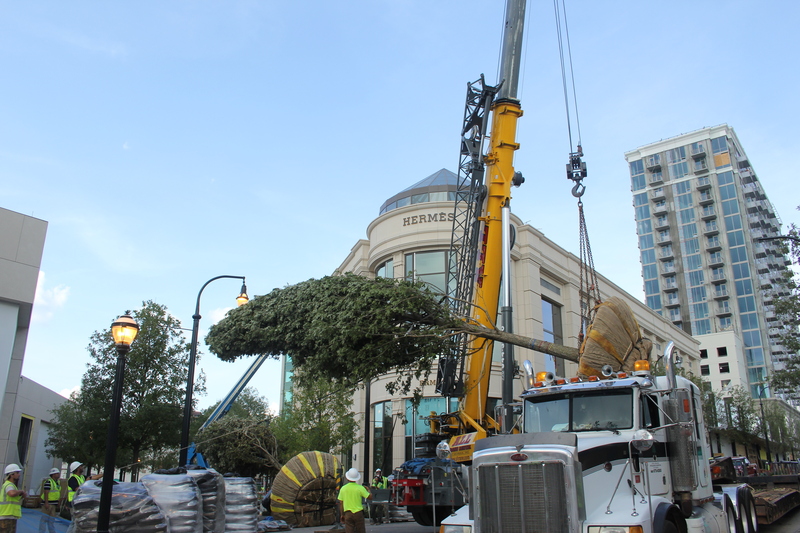 As the hallmark of its Buckhead Atlanta floral design scheme, the firm began planting a canopy of 35-foot oak trees incubated over the past two years at a farm in Athens so they might be installed to look like they’d existed in place for decades. Those who can afford to dwell at Buckhead Atlanta will also be treated to a 22,000 square foot rooftop garden that Hoerr Schaudt–the visionary lauded for the verdant dignity of Martin Luther King, Jr. Drive in Chicago, Illinois–designed. “We made a significant investment of $10 million in the landscaping and hardscaping of Buckhead Atlanta,” Hunter Richardson, managing director of development at OliverMcMillan for Buckhead Atlanta, told Atlanta Progressive News. “We wanted to create the feeling that we have been around for years and that Buckhead Atlanta fits into the fabric of Buckhead, one of the most tree-lined neighborhoods in Atlanta. The trees will be an important element of the landscape of the Buckhead Village for years to come. And they will beautifully provide needed shade in our warm climate,” Richardson said. The 1.5 million square foot Buckhead Atlanta project got underway an unlucky seven years ago, in 2007, just as the market for residential and commercial property took a horrendous dive. Since then, OliverMcMillion has sunk billions into razing and rebuilding an area once known internationally for welcoming tourists and city residents from all walks of life to low-brow establishments and after-hours nightclubs. If all goes according to plan, it will make those accustomed to shopping on Madison Avenue in New York or Rodeo Drive in Beverly Hills, California, feel at home. Buckhead Atlanta consulted with the Atlanta Botanical Garden to select the hundreds of flowers, shrubs, and trees most likely to flourish pleasingly to the eyes and in accord with local climate conditions. Noted author and University of Delaware entomologist, Dr. Douglas W. Tallamy, tells Atlanta Progressive News that Buckhead Atlanta was wise and beneficent to install the Overcup oaks on its acreage. Tallamy is scheduled to appear September 17, 2014 at the Trees Atlanta Kendeda Center for a breakfast discussion about native plants and a signing of his latest book, “Bringing Nature Home”. “It’s critically important to plant trees like that because our cities are becoming dead zones,” Dr. Tallamy said. There are additional benefits the Buckhead Atlanta oak trees–or native trees planted anywhere intown–could provide, Tallamy added. “If they want to sequester carbon emissions, which they surely do, oaks are the best for that. They help protect the watershed because their roots spread deep and wide. They reduce air pollutants and they work to prevent the ‘heat island’ effects that are so terrible in major southern cities,” Tallamy said. Buckhead Atlanta is less about trees, though, and more about elevated levels of luxury for Atlanta’s upper class. Buckhead Atlanta’s commitment to the ecology can’t come cheap. Neither will its offerings. For starters, it will be home to the Manhattan-based Le Bilboquet brasserie chain, where a bowl of soup starts at twelve dollars and a side of fries costs eleven. Buckhead Atlanta’s the go-to district where nothing less than a 1,300 dollar pair of red-soled Christian Louboutin stilettos, or a 200 dollar basic silk necktie from Hermes, will do. Even though most of Atlanta’s working families do not have discretionary spending budgets within sniffing distance of Buckhead Atlanta’s standards, the city’s desperate aspiration for recognition as an upscale shopping mecca depends on its long-term success.